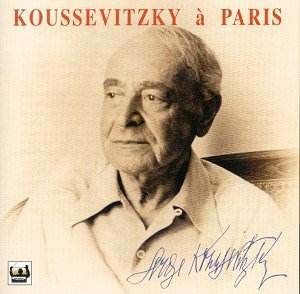 Recorded live in Paris this Ninth was one of Koussevitzky�s last. He was seventy-five and was to die the following year - ten months later in fact. But it doesn�t sound a valedictory performance, even though the veil of constricted sound gives it a determinedly resolute patina, more Furtwängler than Weingartner, more Mengelberg than Kleiber. The powerful rhetorical nature of the first movement, the pauses and caesuri and the (admittedly) shaggy orchestral playing attest to powerfully intense, though equally idiosyncratic direction. The granitic approach is underlined by the heavy booted scherzo � strong, somewhat stolid, the antithesis of the lissom approach of Szell (whose string texture contrasts markedly with Koussevitzky�s bass up sonorities). And yet in the slow movement the Russian conductor outstrips Szell in timings; brisker, certainly, though not actually sounding it, such is the perception of articulation and rhythm. In string quartet terms it�s the difference between the Léner and the Hungarian. It becomes hard fully to distinguish orchestral strands and string choirs, entrance points and wind pointing � facts not aided by the oblique recording quality. His finale is deeply etched, bass up and sinewy. The muddy frequencies afflict pleasure as it must be said they do throughout. The vocal quartet sings in French; they�re perfectly adequate but not outstanding. Cambon makes no attempt to embody the sepulchral and his colleague Georges Jouatte is inclined to sound constricted. Micheau and Michel are spirited but not especially subtle and the choir sounds muddy. There�s a momentary drop out at around 7.45 and later at around 13.40 there are some pitch drops on the tape, by which point the principal trumpet is struggling valiantly with false entries and the choir�s pitch is beginning to sag. The orchestral playing becomes more and more ragged and the conclusion, though immensely exciting, is also immensely approximate. There�s a bonus of a Boston rehearsal of part of the first movement of the Ninth. The notes are none too exhaustive and are mainly biographical, with a couple of paragraphs relating to the conductor�s French concerts. In the end this document, though nobly frail, captures a passionately individual approach to the Ninth. In relatively poor sound it can only really be recommended to admirers of the conductor.